This entry was posted in Christ's Return, Our Events, Our Preaching, The Bible on July 1, 2012 by admin. 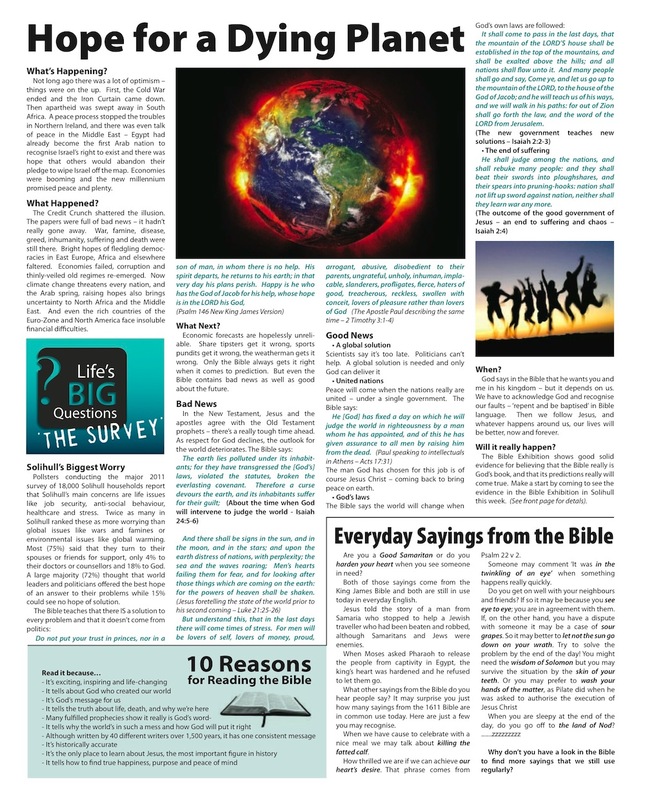 This entry was posted in Our Events, Our Preaching, The Bible on October 1, 2011 by admin. The English and Scottish thrones were united under King James in 1603, and in 1604 he commissioned a new translation of the whole Bible into English. He hoped that this would help unite his kingdom since different sections were using different translations of the Bible. 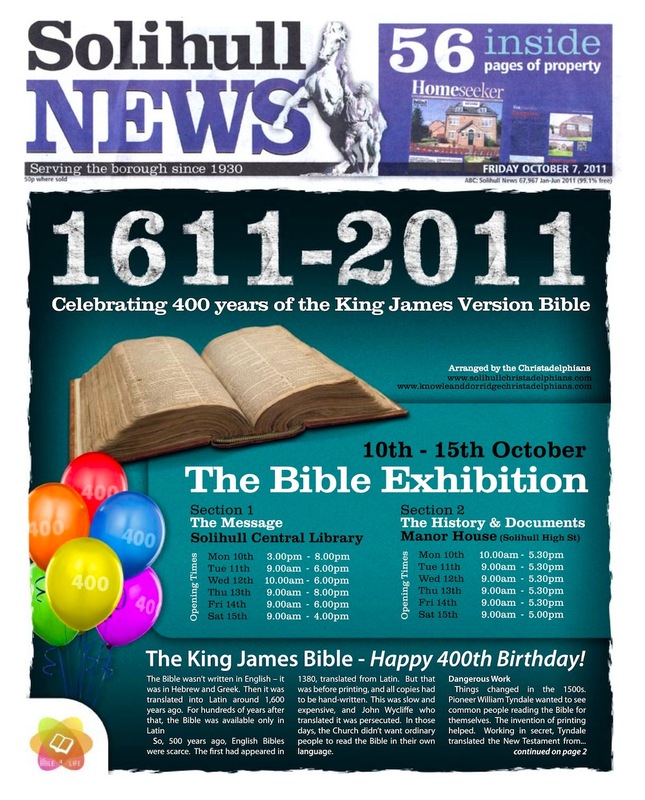 The King James translation was finally published in 1611. Although it was subsequently revised several times until the version generally available today was published in 1769. 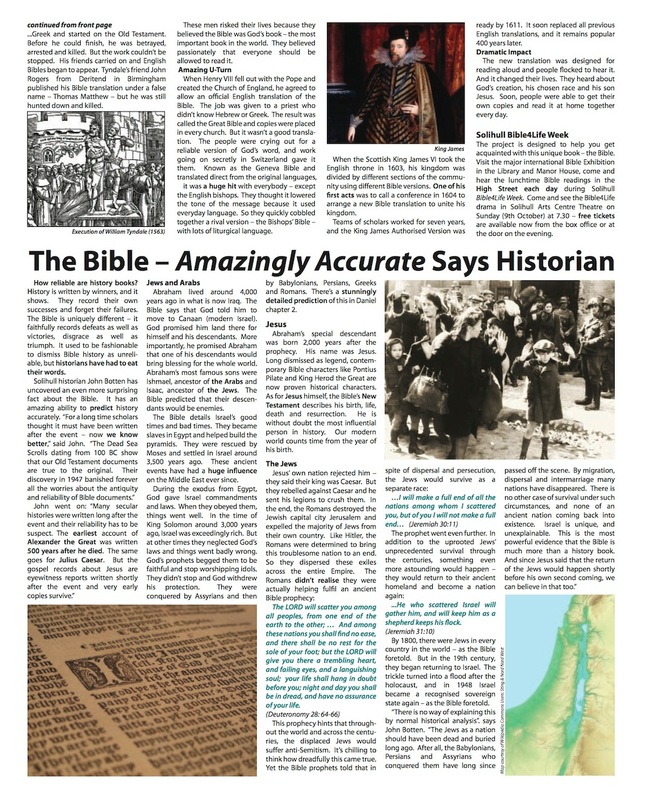 Although it was not the first English translation of the Bible it became the most famous and it has thrilled countless readers over the last 400 years. The King James Bible is widely regarded as amongst the finest literature in the English language. One measure of this is the number of its phrases which have come into common use. Shakespeare is reckoned to have contributed around 100 phases (“To be or not to be?” etc) whereas it has been calculated recently that the King James Bible is the source of 257 commonly used expressions. Did you know these expressions came from the King James Bible? Andrew Motion the poet laureate said “To read it is to feel simultaneously at home, at citizen of the world, and a traveler through eternity” of the King James Bible. In the 20th century there were over 30 major new English translation published. So far in the 21st century there have been more than a dozen new translations. It is clear that far from fading away interest in the bible remains very strong. Before printing was invented all documents were copied by hand – there was room for error. By 1611 the original Hebrew Old Testament and Greek New Testament texts were long since worn out or lost. Only copies of copies of copies were available. Many people worried that over the years the Bible might have gradually changed. In 1947 the first of the Dead Sea Scrolls were discovered. These contained nearly all of the Old Testament books and were around 1000 years older than those available in 1611 and predating the birth of Christ. For the first time it was possible to check for copy errors. The remarkable discovery was that there had been no serious changes over 1000 years of copying by hand. So we know that the Bible translated in 1611 and which we still have today is a faithful copy of the one written by Gods Prophets and Apostles all those years ago. Solihull is to celebrate the anniversary in October 2011. 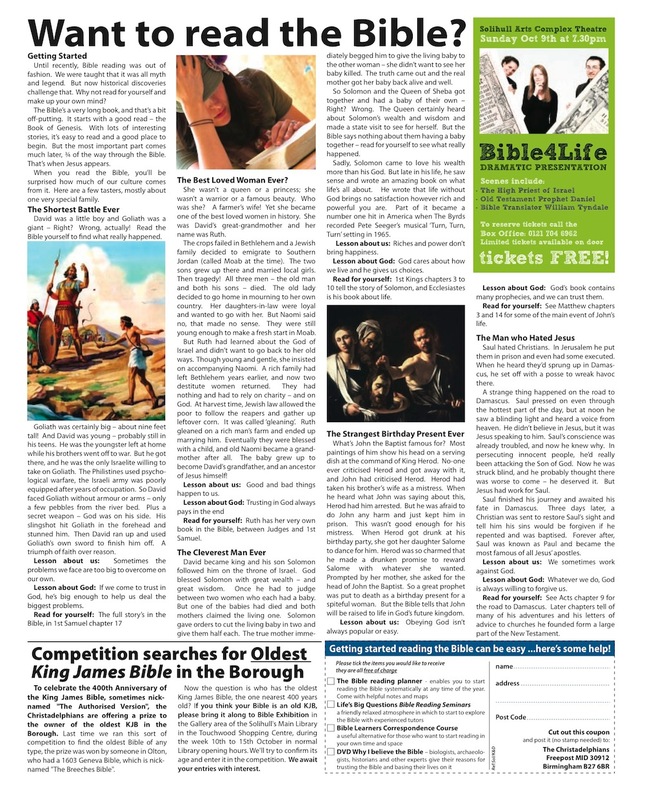 A major international Bible Exhibition will be displayed in Solihull Central Library and the Manor House from Monday 10th to Saturday 15th October. Solihull’s other major celebration is a play at Solihull Central Library Theatre on Sunday 9th October at 7.30pm. 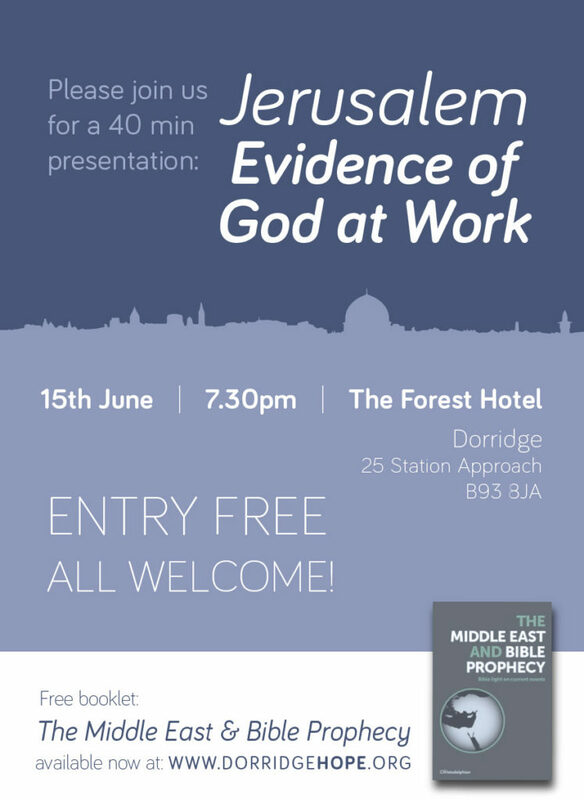 This presents the exciting and sometimes moving story of how the Bible came to be translated into English, with heroic men like William Tyndale being burned at the stake for the “crime” of translating God’s book into a language common people could understand. 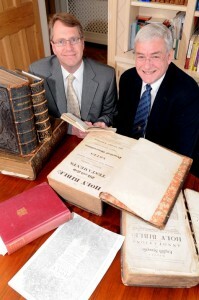 The search is on to find Solihull’s oldest Bible. 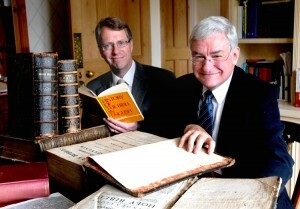 Mike Brown and Steve Harris have been scouring their homes to find the oldest ‘good book’ and are encouraging others to do. They will both be staffing the Bible Today exhibition which is running at Knowle Village Hall and are eager for people to bring along old or interesting bibles. It was Steve’s father Ron, who did just that 20 years ago, and created a conundrum by bringing along a bible that no-one recognised. However with some research it was discovered to be an early collection of annotations, unfinished however, due to the mysterious death of the author in 1679. A prize will be awarded for Solihull’s oldest Bible, but Steve hopes that people will come along to the free exhibition simply if they would like to know more about the Bible. 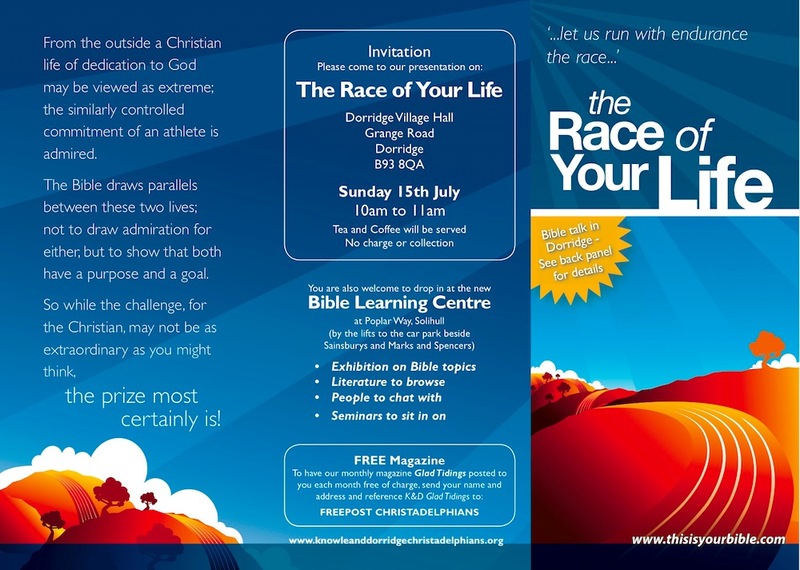 The exhibition, which is being hosted by the Knowle and Dorridge Christadelphians, runs from July 10-13 at Knowle Village Hall. 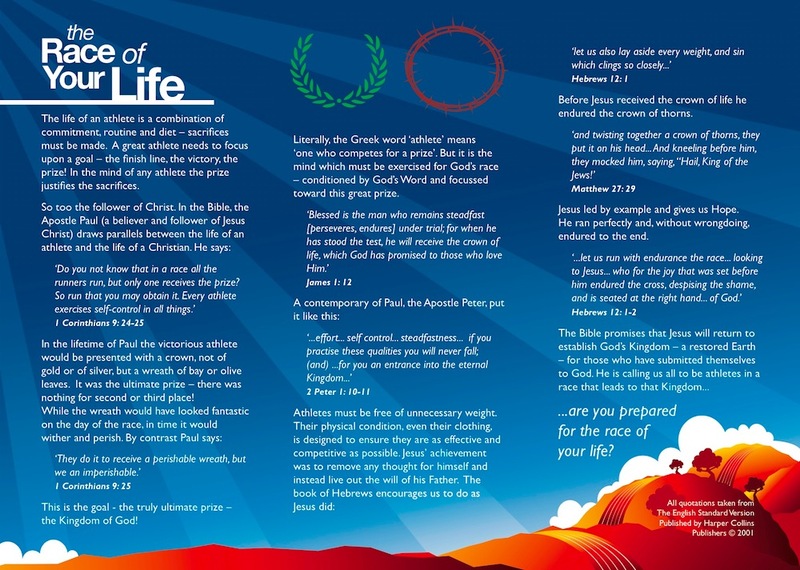 This entry was posted in Our Events, Our Preaching, The Bible on July 1, 2011 by admin.